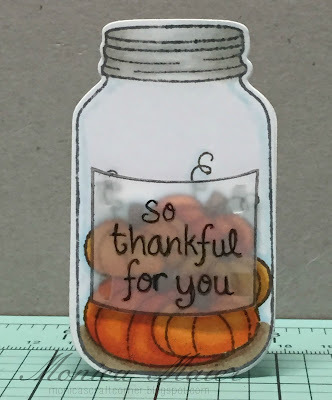 Monica is up first with this delightful jar of "pumpkins", yes, pumpkins in a jar. I didn't think I'd live long enough to see pumpkins in a jar, but, now I can't ever say that again... sorry pumpkins in a jar on aisle 9. 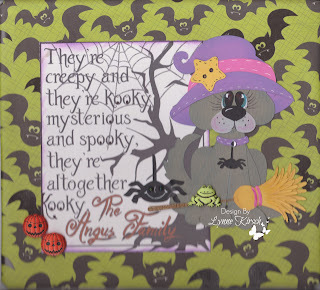 Be sure to visit Monica at Monica's Craft Corner to learn more about this card. Arlene figured that any image that sports the name green in the name should at least have some green. Ivy is one hot mama. Arlene presents Ivy Greenleaf. Morgans Art World Ivy Greenleaf. I don't remember what stamp brand "surprise" is. Be sure to visit Arlene at A Bit of This and That to learn more about this card. 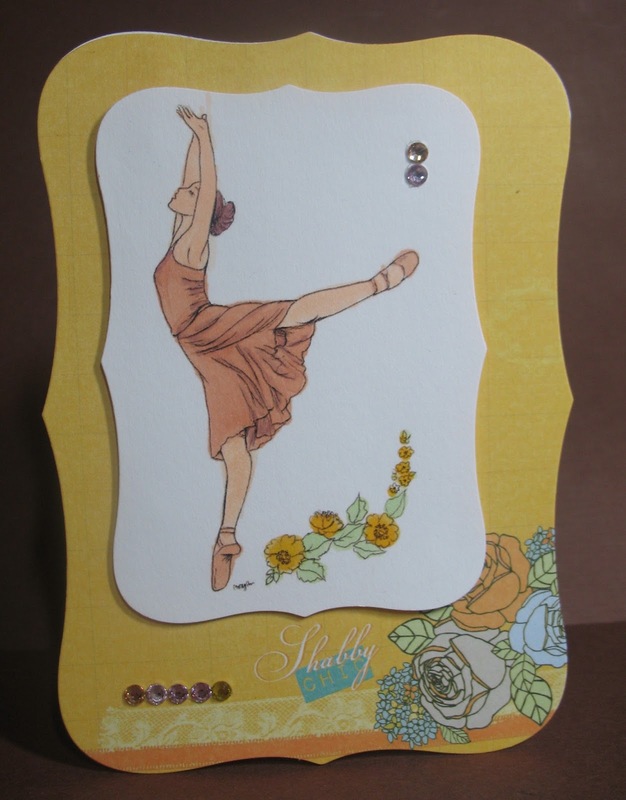 Marsha's last card for the month is featuring the beautiful Ballerina image by Morgans Art world. The base and the main upright panel of the easel card is cut with a Spellbinder Curved Rectangle die. 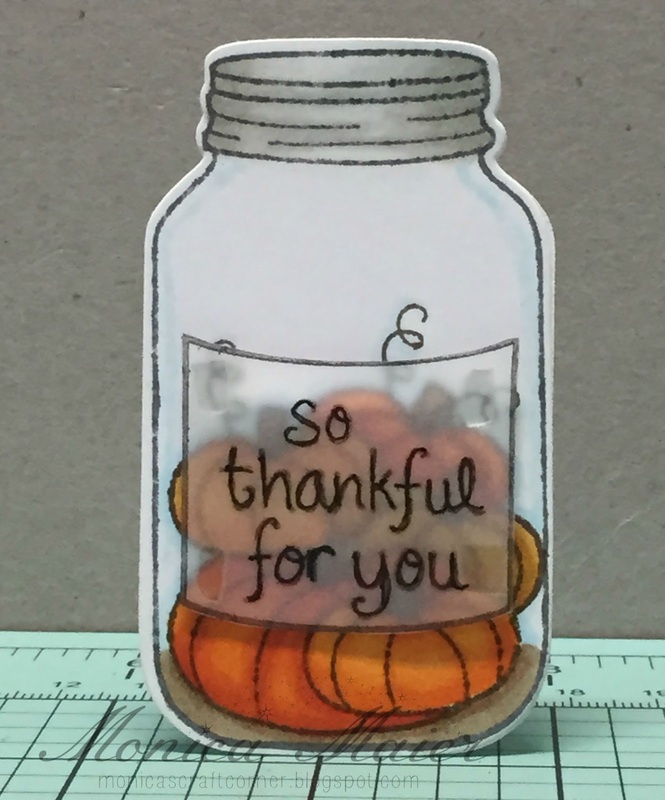 The sentiment is cut out with one of the smallest dies in the rectangle set. 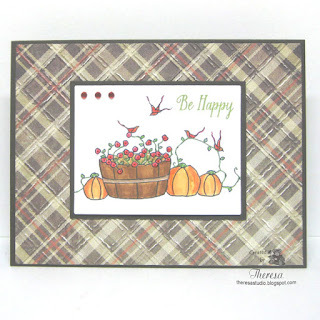 The FlourishVine with leaves is a die by Cheery Lynn. Be sure to visit Marsha at Gramma's Room to learn more about this card. She used a Digital Delight Card Shapes 1 for the base, Couture Creations Scalloped Circles, Elizabeth Crafts Happy Birthday and Impression Obsession Bunch of Blossoms dies. 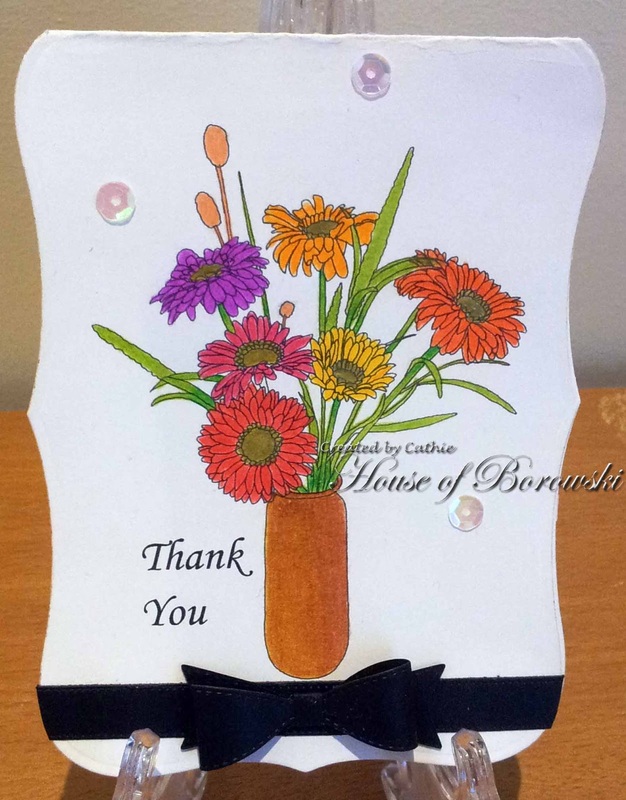 Be sure to visit Cathie at House of Borowski to learn more about this card. Michelle's card is the beautiful Flower 3 image by Morgan's Art World. The card and frame were cut with her Cricut, using the Art Philosophy cartridge. Be sure to visit Michelle at Just A Nutter Paper Crafter for more information. Thank you to Morgan's Art World and to all our followers! It's just a cute little easel. 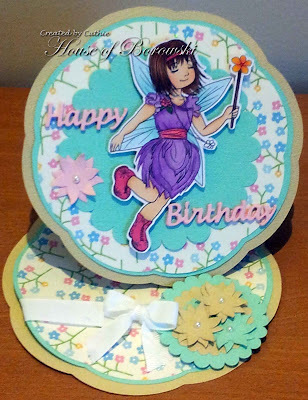 Using some round die cuts and this beautiful Flower 3 by Morgan's Art World, Marsha made a round Easel Birthday card. The circles are cut out with Die-namic Circle Stax dies. The fancy cuts are cut with a Spellbinder Stately Circle die. And lastly the sentiment is stamped onto a Spellbinder Grommet Tag. For more details, please visit her blog, Gramma's Room. 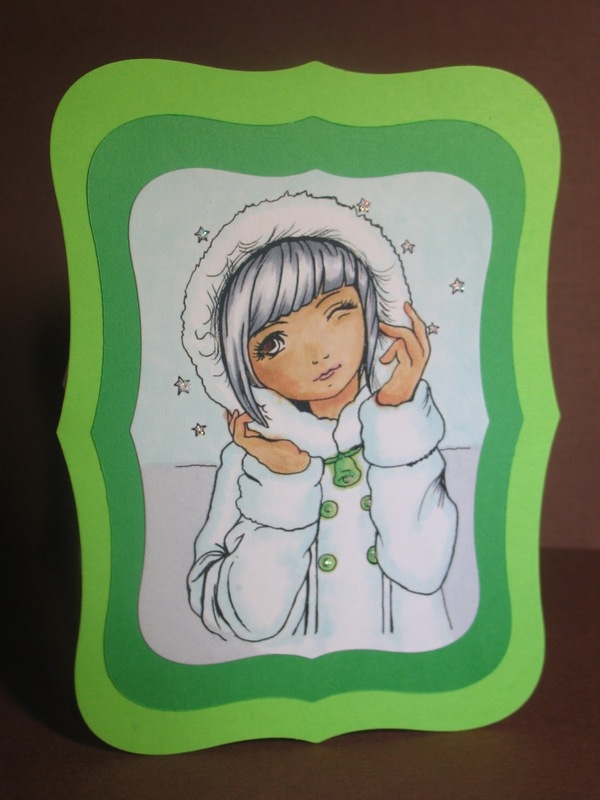 What a beautiful image and she was a dream to color for my first card. Such a pensive look, the hands close up to the face, it all seems to draw you in to the image. I so enjoyed coloring her. Using white for the coat means the coloring seems to fly by, not that you don't have to use color on a white coat. 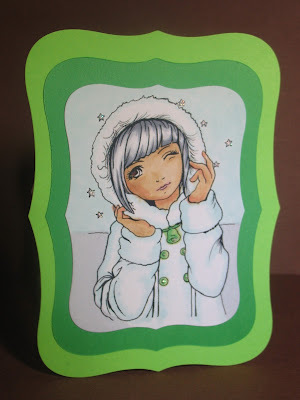 I wanted to intensify the cold, so I used some BG0000 to give it a fresh chill factor. The gray colors in the hair also heighten the effect of cold weather. Another image that captivated my imagination was this ballerina. She is beautiful and one always strives to do justice to art. I don't often use this color, but couldn't help bug grab my Copic marker and begin. I hope you like her too. 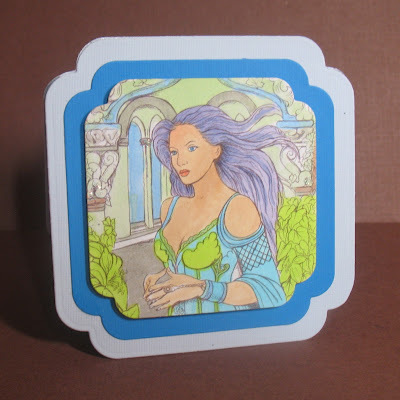 My project today is a centre stepper card which I have cut with a die. I have used a Dove-Of-Peace from the Sue Wilson collection on this Christmas card. 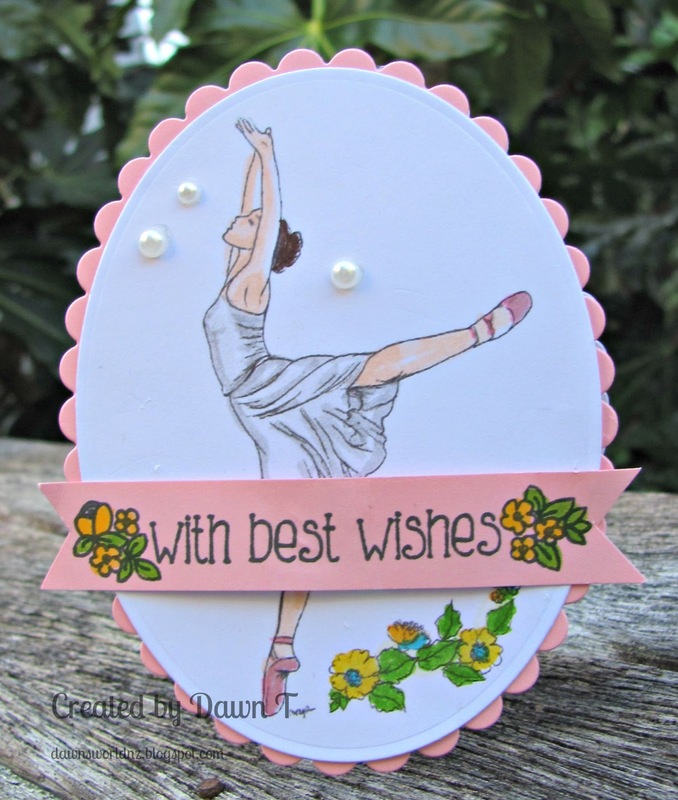 For full details on my project please visit my blog at Cards By Beckie. Don't forget to play along for a chance to win a prize from one of our wonderful sponsors! I started by printing off the image and then cut it using a die. I then colored it with copics. I die cut another oval for the back of the card and scored it about quarter of an inch from the top. Adhered the ovals together and add just a tad of stickles to the center of the flowers. 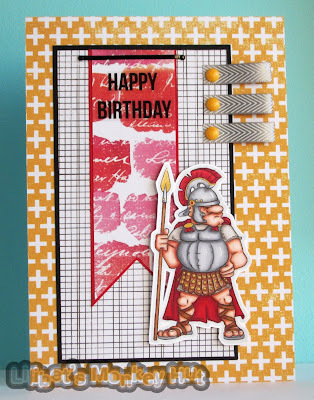 I thought that this Unity Stamp Co. sentiment was perfect for this card! If you would like a list of materials I used, come join me at Just A Nutter Paper Crafter. Hello, Marsha here with you today with a Stair Step card, showcasing a beautiful digital image by Morgan's Art World. Three dies were used: Spellbinder Curved Rectangle, MFT Vine, and Cuttlebug Floral Borders. Cathie here with another shaped card for Diecut Divas. 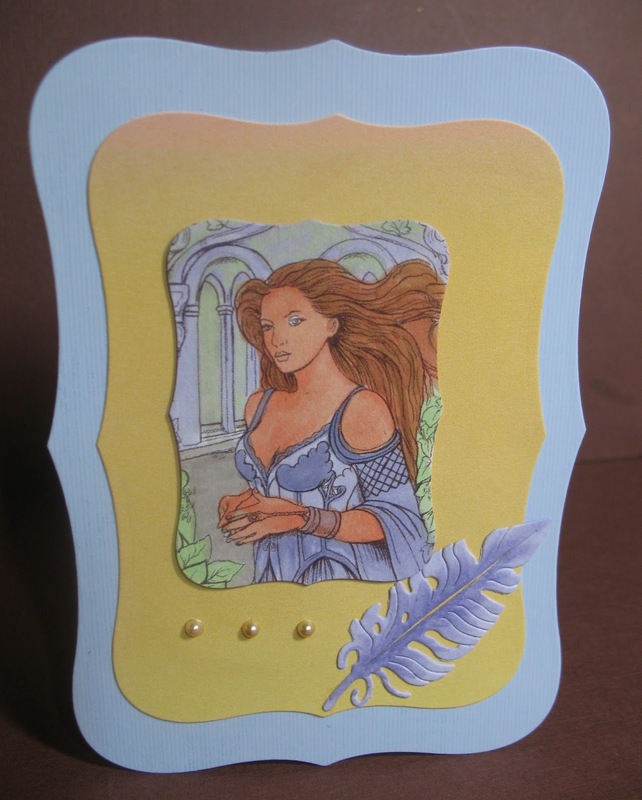 For this card I have used my die to create the card base. 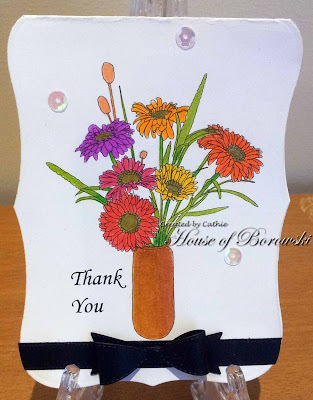 I have used Morgans ArtWorld Garden 9, Spellbinders Label 8 to shape the card. The accent bow is made up of two dies, Cheryl Lynn's Allison Ribbons for the ribbon and Lil Inkers Mini Bow Die for the bow. Shaped cards are a lot harder to do than they look! 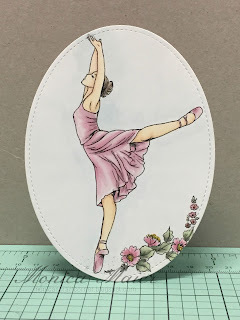 every thing has to be just right, I finally decided on going as simple as possible, I love coloring in images and then cutting them out as the focal point, and this Ballerina needed the Spotlight. Oh and Guess what! I finally got my personal blog going again, Yippee! so check it out Here for more details. I loved the images from Morgan's Art World. I had to (HAD TO) have more than my fair share and also print them out in different sizes and color them in different ways. My first image is smaller and offers less detail than the second. I'm happy with both. I had fun making shaped cards, which I haven't done in quite some time. 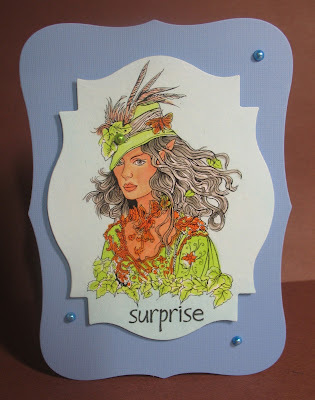 These are examples for the Die Cut Divas' challenge of shaped cards for October. Morgan's Art World is the sponsor for October and I love the images. Be sure to look for Morgan's Art Stamps on her website.or this should get you to the right space to look for her fabulous images. My second card using the same image, but different Spellbinder's die set. I hope you're in shape for our challenge, that is, CARD SHAPE. Ok, a bit hokey, but I'm ok with that. My blog in case you want to visit is A Bit of This and That. Hope you join us this month for a chance to win! I started off printing off the image and coloring it in with my copics. I went with purples and teals since her dress reminded me of a peacock. I die cut the panel and card base, then ran the top card base through my cuttlebug with an embossing folder. Before adhering the panel to the card I ran a white ink over the embossing. A shaped card decorated with a Trimcraft--Tiny-Tatty-Teddy and a Sue-Wilson-Designs--Pierced-Flag with a Congratulations sentiment. Isn't this a beautiful image? This is Orchis Last Enchanter from Morgan's Art World. The card was cut with my Cricut using the Art Philosophy Cartridge, and the image was die cut with Spellbinders Scalloped Circles. 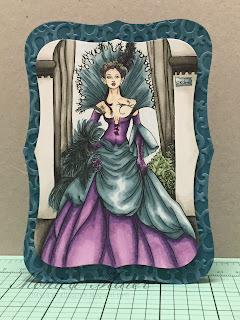 I always like to have my card base finished so I can choose the colors for my images, and the light violet of the dress just seemed to go with the shimmer paper. If you would like more information on this card, please join my at Just A Nutter Paper Crafter! 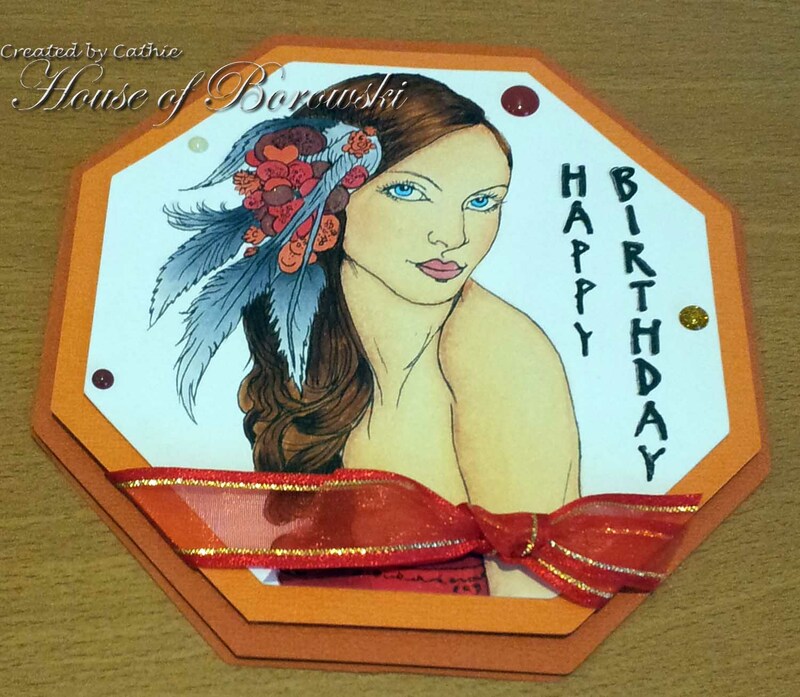 Hi everyone, Cathie here with another shaped card inspiration using Morgans ArtWorld images. I will admit I am a huge fan of Morgan's work, so much so that I am on her creative team. The shaped card aspect was made very easy for me by using my Brother Scan and Cut. This is an electronic cutter, which means using a SVG file, I was able to cut out my shaped card, and my image and my mat all in one go without making a mistake; I love that kind of crafting. Well without further ado, here is my project. Congratulations Lynne, please email the Dcdivas@gmail.com to collect your prize of 7 images from Bugaboo Digital Stamps. 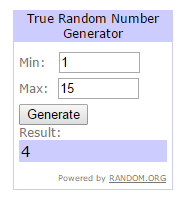 Congratulations Theresa, please email the Dcdivas@gmail.com to collect your prize of a $15 gift voucher for One Happy Cut. 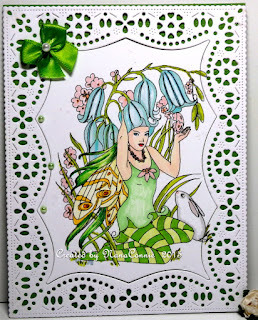 Cathie's pick is: NanaConnie's card, I love the image and the die border is so effective. Monica's pick: Lilibet's Monkey Hut. I love her take on the sketch and the gladiator is awesome! 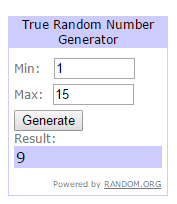 Congratulations to the winners and the DT picks. Don't forget to grab your blog badges from the pages above. The challenge is SHAPED CARDS. Be sure to visit A Bit of This and That to see Arlene's work. Marsha used a beautiful digital image by Morgan's Art World, shaping the card with a Spellbinder die. For more details, visit the Gramma's Room.